In the early stages of a project, the architect may not supply ceiling grid but it is desired for early electrical design deliveries. It is thus up to the electrical designer to supply ceiling grid. DraftLogic Electrical’s ceiling grid tool gives the designer the ability to generate ceiling grids within any closed polyline. Thus, for example, the inner perimeter of a room can be used, a bulkhead line can be used, or the designer can draw an arbitrary polyline wherever desired. The grid DraftLogic Electrical draws will have cell sizes and cell angle specified by the designer. The starting point of the grid can be defaulted to the space/room center point or be centered on a point that the user selects. The 'Ceiling Grid' tool allows the user to select one or many closed polylines (could be a room, collection of rooms, or polylines that are not rooms) and apply the same T-Bar settings to them. With the ‘Mass Ceiling Grid’ tool, a few key presses result in the generation of ceiling grid for all rooms across the entire project that have been designated as having a T-bar type ceiling. In the drawing to the left, we have indicated in the room annotation whether the ceiling type is T-Bar, drywall, open, or mixed. The ‘Mass Ceiling Grid’ tool uses this information to determine which rooms to add T-Bar to. You thus get T-Bar only in the rooms you want it, no matter how scattered around the drawing they are--all with just a few mouse/keyboard clicks! Here are our results from using the ‘Mass Ceiling Grid’ tool. As you can see, only rooms that we indicated as having a T-Bar ceiling received the T-Bar. In this particular use of the ‘Mass Ceiling Grid’ tool, we selected to use each individual's room center as the start point of the grid to achieve a balanced pattern per room. If we had wanted a balanced overall pattern we could have opted for a single grid start point to be applied throughout. 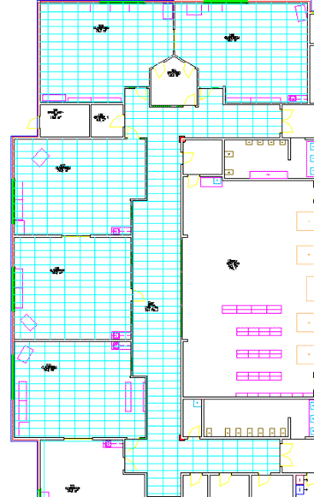 • Generate ceiling grids for areas large and small with a few keystrokes and clicks. 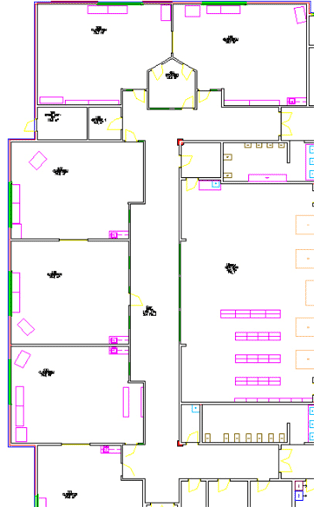 Enables the electrical engineering firm to create lighting layouts before grids are available from the client and produce draft layouts earlier in the design process.